This Stompers-exclusive 18” black leather lace-up boot comes with a front flap and nickel hardware combination as well as black stitching. 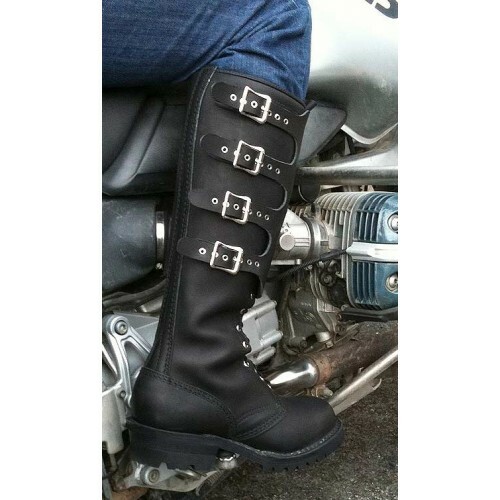 A 100 Vibram lug sole adorns the bottom of the boot to give good traction and is great for motorcycle enthusiasts. Based on the Wesco Jobmaster, this unique boot is made for those who want to stand out in the crowd. This boot is truly unique in its presentation. The 18” length of the boot protects the side of your foot while sending a message to other riders that you’re serious about the quality of your footwear. 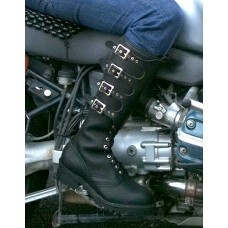 The quality of the leather on this boot shows as it protects your feet from loose gravel on the road and other hazards. 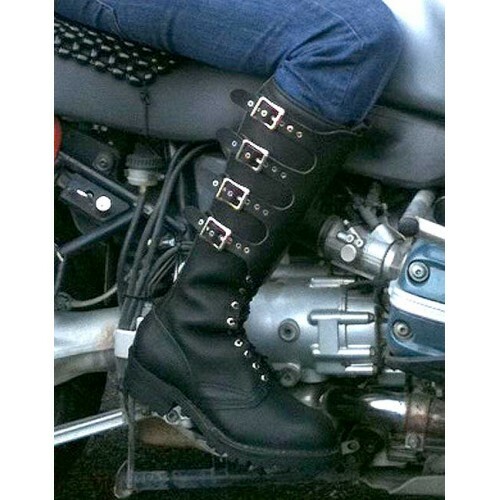 The life of a motorcycle boot is long and hard, so you will need some boots that will stand the test of time. The Stompmaster also comes with multiple options for straps among many other things. 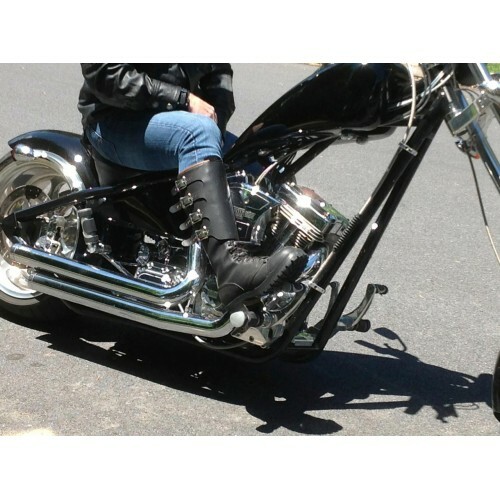 The customization options are limitless as you build boots to truly fit your personality and needs out on the road. 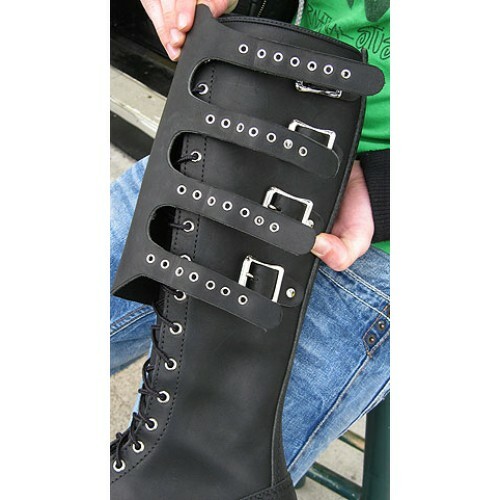 The Stompmaster is a custom boot and can be modified to the hilt. Contact the Stompers store or stop by if you have any questions regarding this boot. Custom measures are done in person to ensure that you have a boot that fits your foot like a glove. 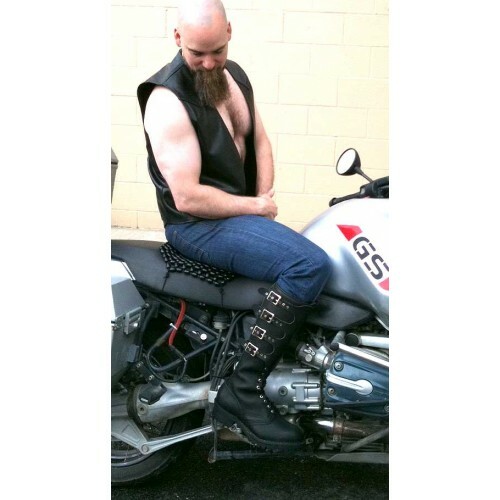 Stompers attends a significant number of the leather events in the US. If you’re going to be at one and wish to have a measure done, feel free to contact us to see where Stompers will be headed next! If you simply have to have the Stompmaster and cannot make it for a custom measure, don’t worry. We can get this boot in standardized sizes from 8-12 in widths D, E, and EE! 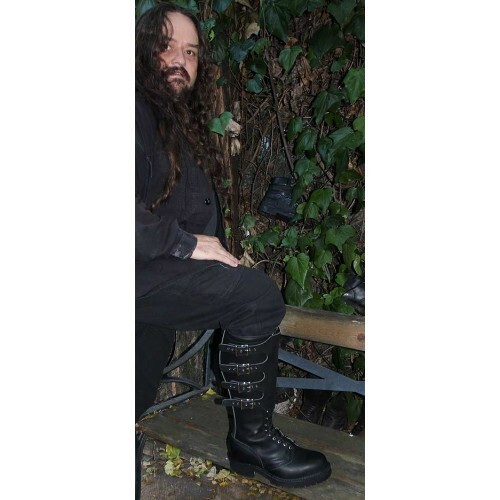 With protection for your foot, a heel designed for support, as well as a unique look to make you stand out, the Stompmaster will garner you both attention and praise as a true boot connoisseur and serious motorcycle rider. These are special order, custom boots made for the owner. Production time is 10 to 12 weeks. Rush orders are available at an additional cost.